Facebook Pages are a great way to promote a brand, and pull traffic to a website. They offer many marketing features, such as targeting a specific audience, learning about insights and analytics, promoting your content, and more. Well now, Facebook has announced in a blog post, that it has introduced some new features to further assist marketers to better promote their content and draw more traffic. These new features include scheduling posts, unpublished page posts, and updated page admin permissions for third-party apps. These new features come as Facebook continues its stream of changes after a survey, that rated Facebook disappointingly low in terms of customer satisfaction. Facebook got a low customer satisfaction rating due to its controversial updates such as the Ticker, the Timeline, and the every-increasing security concerns. Hence, these new features could be a bid to curb the losses incurred by Facebook as marketers reduced their activity. Now, Facebook is back with new options for such marketers. Options not currently available for Google Plus Pages. Alas, this is a feature much awaited for by page admins. Facebook had no scheduling option for posts before, so admins either had to make do manually, or use a a third party app such as HootSuite. While those apps are perfectly fine, it's nice to have an in-build option on Facebook. 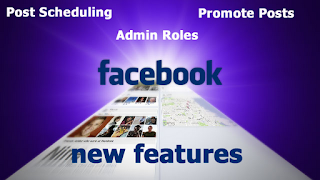 Page admins can now schedule their posts anywhere between 10 minutes to six months from the time of adding a post. They can also reschedule the post if it is more than 3 minutes from its scheduling time. This is a great and easy feature for page admins, who don't have to use any third party apps. Scheduling your posts will bring consistency to your page. In fact, it is a whole marketing strategy, scheduling posts at an optimum time so that maximum of your followers can see them. Here is another great new feature designed especially for targeted marketing. It is for page admins who sometimes want to send sponsored updates. These posts aren't really published, and don't show up on your timeline. Instead, they are sent to your followers based on their demographics that you choose. For example, you can send out posts only to men, or only to women etc. You can use this feature to run segmented marketing campaigns. This is another great release aimed at restricting permissions to other admins and third party apps. Previously, there were fixed privileges for admins, which means if you needed an app to access your page to manage it, you had to grant it full permissions. But now, you can limit what permissions you give out. For example, a post scheduling app doesn't need to access your insights, not vice versa. Hence, you can restrict permissions to ensure more security.